From the death of her parents at sixteen, Maggie Jordan yearns for lost family, while sister CJ drowns in alcohol and brother Tibs withdraws. When Maggie and an idealistic young writer named Jackdaw fall in love, she is certain that she’s found what she’s looking for. As she helps him write a novel, she gets pregnant, and they marry. But after Maggie gives birth to a darling boy, Jes, she struggles to cope with Jes’s severe birth defect, while Jackdaw struggles to overcome writer’s block brought on by memories of his abusive father. Ambitious, but never seeming so, Deep Down Things may remind you of Kent Haruf’s Plainsong and Jodi Picoult’s My Sister’s Keeper. 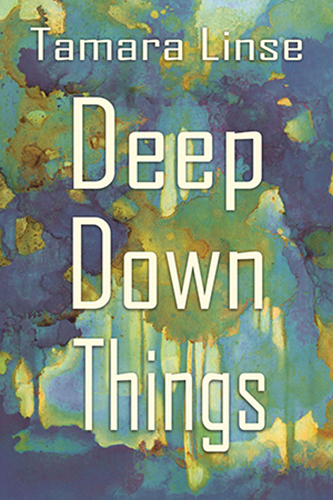 Like the characters in Deep Down Things, the author Tamara Linse and her husband Steve have lost babies. They had five miscarriages before their twins were born through the help of a wonderful woman who acted as a gestational carrier. Tamara is also the author of the short story collection How to Be a Man and earned her master’s in English from the University of Wyoming, where she taught writing. Her work appears in the Georgetown Review, South Dakota Review, and Talking River, among others, and she was a finalist for an Arts & Letters and Glimmer Train contests, as well as the Black Lawrence Press Hudson Prize for a book of short stories. She works as an editor for a foundation and a freelancer. Find her online at tamaralinse.com and on her blog Writer, Cogitator, Recovering Ranch Girl at tamara-linse.blogspot.com.